Key Difference: Windows 7 and Windows XP are two operating systems that are offered by Microsoft for running on their PCs and Laptops. Windows 7 offers a new layout and look, while Windows XP offered upgrades on the older Windows 2000 and Windows ME systems. Windows 7 and Windows XP are two operating systems that are offered by Microsoft for running on their PCs and Laptops. Windows XP operating system was lunched in 2001 and was upgrade for the Windows 2000 and Windows ME. Windows 7 was the upgrade for the Windows XP OS and was launched in October 2009. Both of these systems offered some great features for users. Usage for Windows XP has declined and is only found on older computers, while Windows 7 has become the most used OS. Windows 7 was launched in October 2009 as a way to make the computer more user-friendly, as well as offer some upgrades on the already present Windows Vista system. While, Vista sought to offer many new features, Windows 7 was launched as an upgrade that was designed to work with Vista-compatible applications and hardware. 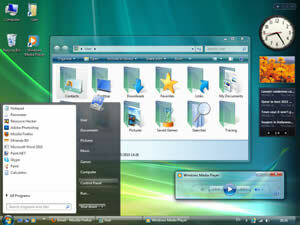 The main change that was offered with Windows 7 was the new Taskbar that was dubbed as ‘Superbar’. The main reason for the launch of Windows 7 was to make a more user-friendly windows system and incorporate the new features of Windows Vista that were appealing to the people, but failed when Vista tanked. The new features that were introduced on Windows 7 included: extended support for Vista themes, gadgets side bar that allowed users to add calendar, clock and other such gadgets on the desktop, Windows Explorer supports Libraries (which shows all virtual folders and content in a unified view), changes to the Start Menu, shut down button has been altered with more options only available if the arrow is clicked, jump lists on the taskbar when hovered on right-clicked on, search box has been extended to support items in Control Panel. Additional features include Aero Snap and Aero Shake. When Windows is dragged to the top right hand side of the screen it automatically maximized and minimizes when it is pulled away. In Aero Shake, shaking a window on the screen will only keep the shaken window active and the rest of windows will minimize. Additional keyboard shortcuts have been introduced. Win+ + and Win+ - (minus sign) zoom the desktop in and out. Windows 7 was launched in six different editions: Home Premium Edition, Professional Edition, Ultimate Edition, Starter Edition, Enterprise Edition and Home Basic Edition. The first three editions were available for retail sale for consumers, while the Starter edition was preinstalled by OEM, the Enterprise edition only by volume licensing, and Home Basic only to certain developing countries' markets.The Windows 7 was a hit with many of the Microsoft customers and was used widely as an operating system. The Windows 7 required a 1 GHz processor, 1 GB RAM, DirectX 9 graphics processor with WDDM driver model 1.0, 16-20 GB (depending on architecture) free disk space and a DVD-ROM drive. Windows XP operating system was launched by Microsoft for use on personal computers and is the second most popular version of Windows. Windows XP was released in October 2001. The ‘XP’ in the Windows is adapted from eXPerience, indicating enhanced user experience. Windows XP was the successor to Windows ME and Windows 2000 and was the first consumer-oriented system developed by Microsoft on the Windows NT Kernel. Windows XP offered customers a redesigned graphical user interface, which was considered more user-friendly. The Windows XP offered customers a better Start Menu and task bar and added additional features such as translucent blue selection rectangle, drop shadows for icon labels, task-based side bars in Explorer, ability to lock taskbar, ability to group taskbar buttons together, etc. These added a more appealing look to the plain interface that was available in the older versions. The company offered two major editions of the operating system: Windows XP Home Edition and Windows XP Professional Edition. The Home Edition was for users and was pre-installed in systems, while the professional edition was offered for business users and offered advanced features. The company added a third Windows XP Media Center Edition that allowed users to incorporate new digital media, broadcast television and Media Center Extender capabilities. These were not for commercial sales but were available as OEMs. The system requires 233 MHz clock speed, 64 GB RAM, Super VGA (800 x 600) or higher resolution, 1.5 GB or higher HDD space, CD-ROM drive, keyboard and mouse and sound card, speakers or headphones. 2 – 192 GB depending on the version and architecture. 4 GB-128 GB depending on the version and the architecture. Supports the mounting of a virtual hard disk (VHD) as normal data storage. The Remote Desktop Protocol supports real-time multimedia application. New networking API with support for building SOAP-based web services in native code. Ability to discard a newer device driver in favor of previous one. Remote Assistance and Remote Desktop features. Handwriting recognition, speech recognition and digital ink support. Windows Photo Gallery, Windows Movie Maker, Windows Calendar and Windows Mail. NetBEUI and NetDDE are deprecated. DLC and AppleTalk network protocols are removed. Plug-and-play–incompatible communication devices are not supported. Service Pack 2 and Service Pack 3 also remove features from Windows XP. very useful information to me "thank you"